Make this homestead yours for a year-round residence, vacation home, or nice hunting getaway at a great price! 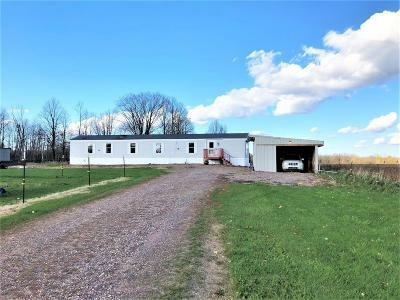 This 3 Br, 2 Ba home on 10 acres has been well kept and is turn-key with most furnishings and all appliances included in sale! You&apos;ll want to call this your home sweet home once you see what&apos;s inside. You have an open concept kitchen/living area with spacious eat-in kitchen, breakfast bar, pantry, and picture window to watch the wildlife outside. The large master bedroom is complete with walk-in closet and roomy bathroom with stand up shower and soaking tub. The other two bedrooms are spacious with second guest bathroom and laundry nook in the hallway. The yard has been fenced for a horse pasture and could be continued as such for a hobby farm or turned back into a lawn. There is a one-car garage for parking as well as an additional shed for stalls or extra storage. The adjacent crop field attracts wildlife, and the hilltop view provides great sunsets & sunrises. Call today!